Feeding your iguana a well balanced diet of greens, vegetables, fruits and some other foods will help ensure that you have a happy and healthy pet. Be sure to supply your pet with a variety of different foods. This helps make sure the diet is balanced and is a way for your pet to try different and interesting foods. Most of the foods needed are easy to get from pet stores and grocery stores. Fresh greens and vegetables should make up most of your pet’s diet. The food should be chopped up to make eating it easier. Some greens you could feed your pet include collard, mustard & dandelion greens, turnip greens, kale, and romaine lettuce. Vegetables your iguana may like are shredded carrots, peas, green beans & other beans, bell peppers, and squash. Frozen vegetables can be substituted from time to time or when you have run out of fresh food. A mixture of french-cut green beans, peas, carrots, lima beans, and corn is a good emergency food. Make sure you warm the frozen veggies to room temperature before feeding them to your iguana. Running warm water over the frozen food is a quick way to thaw it. Fruit can be added to an iguana’s diet for variety. Some fruits your pet may enjoy include strawberries, blueberries, bananas, apples, and cantaloupe. Like other foods, fruit should be chopped for easy eating. There is commercial iguana food available that can make a nice addition to your pet’s diet. Iguana food is usually in pellet form and can be mixed with other foods your pet eats. Since the pellets are dry, moistening them before feeding is a way to make them healthier. 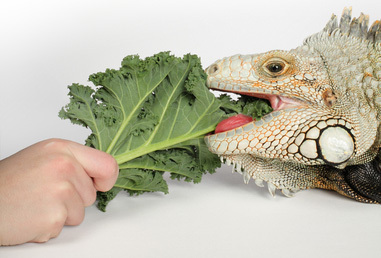 Iguana food should not be the primary diet of your iguana. Bread and grains can be occasionally added to your pet’s food. Cooked pasta, cooked rice, and whole grain bread make a nice treat for your iguana. Make sure the food is chopped for easy eating. Crickets and mealworms are often a standard part of a pet reptile’s diet. This is not the case for green iguanas. They are herbivores and are not designed to eat insects. Insects are a source of protein and adult iguanas do not need a lot of protein. What protein they need is gotten from greens and vegetables. Too much protein may actually be harmful to a pet iguana. An iguana will get a lot of his water from his food, but still needs a source water. A heavy bowl, that is difficult to spill and filled with fresh water, should always be available. Reptile supplements help ensure a pet iguana gets all of his necessary vitamins and minerals. A calcium & vitamin D3 supplements can be added to your pet’s food a couple times per week. A reptile multivitamin can be added to your pet’s food about once a week. Supplements usually come in powder form and are easily sprinkled onto food. You only need to sprinkle a very small amount. Supplements should be added to your iguana’s food in moderation. Too much supplementation can be worse than none at all.